In this article, I am giving you a crash course in Inkscape. This tutorial is designed to get you up and creating vector art with this free, open-source program. That means by the time you finish this article, you’ll know the basics and some other useful techniques in Inkscape. In the world of vector drawing programs, Adobe Illustrator is the king, and for a good reason. Illustrator is one of the most advanced, robust, and powerful vector drawing programs in existence. I honestly love Adobe Illustrator. It’s one of the first vector programs I’ve ever used. One of the down-sides to Adobe Illustrator is the price tag. Right now the full version runs at $699.00 USD. Ouch! Thankfully Adobe has come to terms with the fact that a lot of us don’t have an extra $699 to throw around. You can choose Adobe’s subscription (rental) option for $19 USD per month, or pay $49 USD per month for the entire Adobe Suite. I see the subscription option as a much more viable option, even though it crushes the notion that you actual own the software. But you get the latest software at a very low entry point. There’s a large enough contingent who, over the years, feel rather disgruntled and frustrated with Illustrator’s bugs and bloat. Many of these people are die-hard Macromedia Freehand users. For over a decade, Macromedia Freehand has been Illustrator’s closest competition. In 2005, Adobe bought out Macromedia, and acquired Freehand. Unfortunately for Freehand users, the program got axed by Adobe in favor of Illustrator. (No surprise there.) As of this posting, the closest competition Illustrator has is CorelDRAW. One up-and-comer was Creature House Expression. I’ve used it since version 1. Expression had a different take on vector illustration. It used vectors as a method of painting. 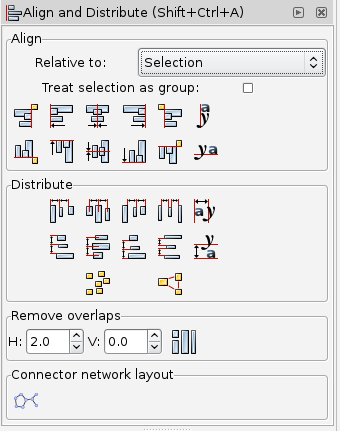 Expression was the first program to have skeletal strokes. That was revolutionary! But Microsoft bought Creature House, and after some time sitting on the product, they eventually released a half-hearted Windows-only version called Microsoft Expression Design. Eventually that was discontinued. Does this mean we have no other alternatives to Illustrator? Maybe not as powerful or robust, but alternative vector programs are still plentiful. Let’s talk about a free, open-source alternative that I’ve been using for a while, Inkscape. I myself am a big fan of the open-source movement. Basically it’s a community of developers and users who fund and develop software that is free for anyone to use. The developers are financially supported by donations from users. The vast majority of these developers work on open-source software projects on a part-time basis. Two of the open-source movement’s brightest stars in CG software are Blender 3D (3D design) and the GIMP (image editor). I personally am a big fan of Blender 3D. It’s an extremely mature 3D program and can easily go toe-to-toe with most any other 3D program on the market. GIMP is a good alternative to Adobe PhotoShop for most people who need a robust image editor. In all honesty, only the line art was done in Inkscape. The coloring and effects were done in PhotoShop. During the creation of this piece, I was learning on the fly. At some points, things just dragged along just because I didn’t know how to achieve certain techniques that I could easily pull off in Illustrator within Inkscape. Before the State of the Site header, I thought Inkscape had just been riddled with bugs for the entire time I’ve had it on my iMac. The first hurdle was the fact that Inkscape on the Mac runs under the X11 environment. X11 is Apple’s spin on XFree86 Project’s X Windows System, which is the foundation for Linux’s GUI interface. X11 follows the same keystroke conventions as Windows. 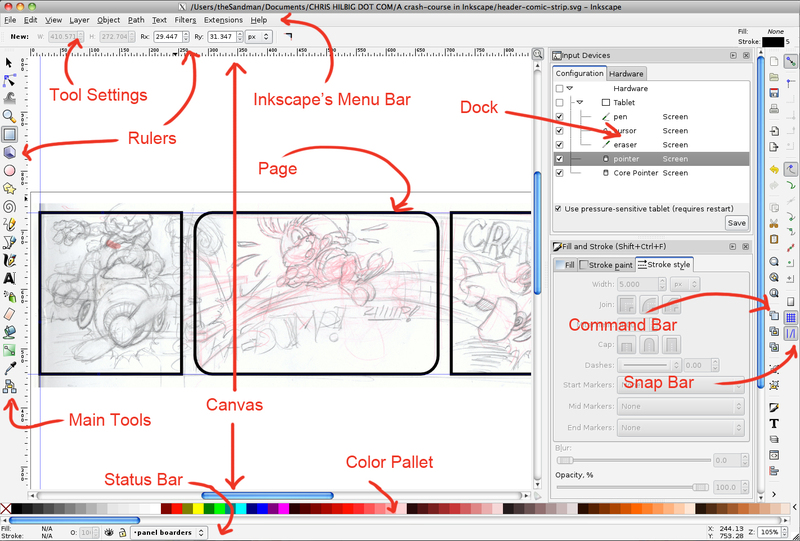 On top of that, Inkscape’s interface was nothing like Adobe Illustrator’s. The way Inkscape approached vector drawing was very different then what I was used to. It’s not as intuitive as Illustrator in my opinion. Menu Bar: If you’re a Windows or Linux user, this’ll be quite familiar. If you’re a Mac lover, this will be your Menu Bar. This will be where the majority of your options are. Tool Setting: Where you’ll adjust the settings for your main tools. Rulers: Most CG artists are familiar with rulers. A click-drag from either ruler will let you create a guide. Canvas: The area that contains your page. This is also the area where you’ll create your paths, objects, and raster art. Page: The area that will hold your artwork whenever you export or print your documents. Any objects outside the page will not print or be exported. Dock: This will store your palettes to adjust different settings. Command Bar: Contains shortcuts/buttons to many of the items/settings within the menus. Snap Bar: To adjust or set what snaps to what. Status Bar: This has gobs of information in one glance. The Status Bar tells you the color an object’s using. You can adjust the opacity of an object or path. You can lock, hide/show, and change layers. The Status Bar also provides useful tips. It tells you your cursor’s coordinates. You can also adjust the zoom. In X11 on the Mac, Copy, Cut, and Paste will leave you with a rasterized version of any vector object or path. (I believe this is just a limitation of Apple’s X11 environment. You can freely copy, cut, and paste vectors in Windows and Linux versions of Inkscape.) That also means if your on a Mac, you can’t copy or cut any vector object or path to another application without it being rasterized. To prevent Apple’s X11 environment from rasterizing your vector objects, go into your Menu Bar, click X11 menu > Preferences… > Pasteboard button > uncheck Enable syncing. Doing this will allow you to Copy, Cut, and Paste your vector objects and have them remain as vectors. If you want to duplicate any vector object use Control-D. To move any vector object or path between layers, go to the Layers menu or use keystroke Shift-Page Up to move a selection to a layer above. Shift-Page Down to move a selection to a layer below. To move a selection to the layer above, Ctrl-Page Up button. To move a selection down a layer, Ctrl-Page Down button. To raise a selection to up the stack, Page Up button. To lower a selection to down the stack, Page Down button. To raise a selection to the top, Home button. To lower a selection to the bottom, End button. Ctrl key to restrict movement of a selection to horizontally or vertically. Shift key to disable snapping while dragging around a selection. Arrow keys can be used to nudge a selection. Left-Clicking a selection will give you handles to resize it. Clicking that same selection again gives you handles to rotate and skew. For more information and keystrokes, check out Inkscape keyboard and mouse reference. Selector Tool: (S or Spacebar) Of course you can select objects with the Selector. But you can also use the Selector tool to resize. With a second click, you can rotate and skew the selection. Node Tool: (N) The Node Tool in Inkscape is pretty versatile. It lets you select nodes and adjust their handles to adjust the paths. Click and dragging a section between nodes also adjusts the curve and brings out the nodes handles. Shift-C will let you adjust the node’s handles independently of each other. If your path or object has a gradient, either within the fill or stroke, the Node tool is also capable of adjusting the gradient handles without the need to switch to the Gradient Tool. Tweak Tool: (W) The tweak tool actually has quite a few tricks. You can push and pull paths and objects, shrink, roughen, shift the object’s color, and blur the object. Zoom Tool: (Z) This is self-explanatory for most of you. The Zoom Tool lets you zoom in and out (when holding the shift key) of your drawing area. You can also use the – (minus) and + (plus) keys to zoom. An Inkscape rectangle. Click to enlarge. 3D Box Tool: (X) This tool will let you create live 3D boxes in Inkscape. When you create your first 3D box, you’ll find handles for all three vanishing points; X, Y, and Z. The 3D box tool is great for perspective drawing. Star Tool: (*) The Star tool creates objects that can be formed into stars or polygons. You’ll find two handles on your newly created objects, one to adjust the points, the other to adjust the inside corners. The settings, under the menu bar, let you change the number of corners, the roundness of the corners, and there’s a setting that let you turn your polygon into wacky abstractions. Spiral Tool: (i) For all of your spiral creation needs. You’ll find two different handles on your new spiral. One handle to control the end in the inside of the spiral, and the other for the end on the outside. Freehand Tool: (P) The Freehand Tool lets you create editable paths. This is probably best used with a graphics tablet. Calligraphy Tool: (C) The Calligraphy tool lets you create lines with varying widths. The end result isn’t a skeletal stroke, but a newly created object with just a fill. The Calligraphy Tool can be used with a graphics tablet to paint, ink, and draw with, but my experiences so far haven’t been particularly great. As a warning, this tool will require some patience. It has different presets that create different effects as you draw, but for inking, I recommend using the Brush preset, set both Tremor and Wiggle set to 0. Play around with the rest of the settings until you get a more desired result. Your new stroke will also be loaded with nodes. I also recommend to click the Path menu, and select Simplify (Ctrl-L) to reduce your nodes and smooth out your strokes. Text Tool: (T) With the text tool you can click in a spot and start typing or click and drag to create a text box reminiscent of your favorite page layout software. It has all of the necessary settings to manipulate and adjust your text. Spray Tool: (A) The Spray Tool’s an interesting toy. What the Spray Tool does is duplicates the last selected object in clusters as you drag your cursor across the canvas. The Spray Tool also has options that scatter and rotate your duplicates. Eraser Tool: (E) The Eraser Tool comes in handy for those times when you get a little sloppy. The Eraser Tool works in one of two ways, either it’ll create a temporary path that will delete any object beneath it. Or the Eraser Tool will create a new object, much like the Calligraphy Tool, and with the new object, use it to cut into the object under it. So it’ll look like you’ve just erased a part of an object. Paint Bucket Tool: (U) The Paint Bucket Tool works like any other paint bucket tool, it floods areas with color. The Paint Bucket Tool also works much like its equivalent in Illustrator. It can flood-fill in between objects, creating new objects. The Paint Bucket Tool is also sensitive to bitmap areas or raster objects. It’s smart enough to flood-fill in an area of a raster object and create a new object based on that area. The Paint Bucket Tool can also be applied to vector objects, creating duplicates with a different color. Gradient Tool: (G) The Gradient Tool can be used to apply gradients to your objects, but I think it truly shines as a tool to adjusting the gradient within your object. Based on the type of gradient your using, you’ll find some handles. You can use the handles to position where you want you color to begin. The handles can also be used, when you select one of them, to let you determine what color you want to use in that end of the gradient and the transparency with the Fill and Stroke Pallet. Dropper Tool: (D) The Dropper works just like any other dropper tool in the sense that it can pick-up color anywhere in your canvas. If you have another object selected while using the Dropper Tool, it’ll change the fill to that color. As of now, the Dropper tool isn’t capable of picking up the stroke color, and applying that color to the stroke of your selection, like in Illustrator. Connector Tool: (O) The Connector Tool is not something I’ve used until writing this article. This tool is great for people who create diagrams. Basically the Connector Tool’s sole use is to let you create lines that connect to your objects. Once those lines are created, they’ll remain attached to your objects. If you have two squares linked together, and you choose to move one of them, the line will stretch/squash, and follow your square. For more information on the tools from the Main Bar, check out Inkscape keyboard and mouse reference. Next up in our fun-filled Crash Course in Inkscape, we’re going to learn about many of the useful palettes that you will be using on a daily basis. And when I say useful, I mean important. These palettes can be access in Inkscape’s Command Bar. The Command Bar also has some buttons for redundant actions like Save, Copy, Cut, etc. If you’re unable to guess the keystrokes, you can find those commands in Inkscape’s File and Edit menus. You will be using the Fill and Stroke Palette constantly. It’s structured much like any other color palette in a vector program. For both the Fill and Stroke, you can choose no color, a flat color, a linear gradient, a radial gradient, pattern fill, do a swatch fill, or make it undefined. (I’m not sure what exactly that means yet.) The Fill and Stroke palette gives you tabs for all of the major color spectrums to use plus a color wheel (which I love). Along with color, the palette lets you change the transparency of your fill or stroke with the Alpha Slider. Inkscape also has an Opacity Slider, which controls the opacity of the entire object. Objects can be easily blurred with the Blur Slider. In the upper right-hand corner of the Fill and Stroke palette, you’ll notice two strange buttons, the icons look like hearts. Both of these buttons let you chose which Fill-Rule you want to use. The heart shape with the hole in it (on the left-hand side) will apply the Even-odd Fill-Rule to your object. What this means is that if your object has a path that overlaps itself, the areas where it overlaps will be a hole or empty space. The solid-looking heart, on the right-hand side, uses the Non-zero Rule. What this means is that in order to have space or gaps with in an object, that space has to be created with a sub-path. The sub-path has to create a space that Inkscape considers “outside” the path. You’re using the sub-path to poke a hole into your vector object. It’s what happens when you overlap two objects and apply Difference or Exclusion to them. For slightly better explanation, you can read up on the Stroke and Fill palette’s Fill-Rule Attribute. The Stroke Style tab is almost identical to any other stroke style palette in any vector program. The only major difference that I can think of is Illustrator let’s you set the size of the gaps and dashes in its Stroke Style palette. Inkscape only gives you an option to off-set the pattern. But Inkscape has a large array of pattern presets, so this may not be a huge deal-breaker. Yes, Inkscape does have layers. You can toggle between them in ether the Status Bar or within the Layers Palette. The Layers Pallet does a few other major functions that most of us would expect from any serious graphics program: creation and deletion of layers, name layers, lock, hide, Blend Modes, and Opacity. You can also move layers up and down the stack, but you have to use the arrow buttons in the Layers Palette. Unfortunately you can’t freely drag the around individual layers. From a user’s perspective, that can be an annoyance. Ctrl-Page Up: to move up a layer. You can easily copy, cut, and paste paths and objects between layers in Inkscape. But you can just as easily move selections between layers. Those options can be found in the Layer menu > Move Selection to Layer Above (Shift-Page Up) and Layer menu > Move Selection to Layer Below (Shift-Page Down). 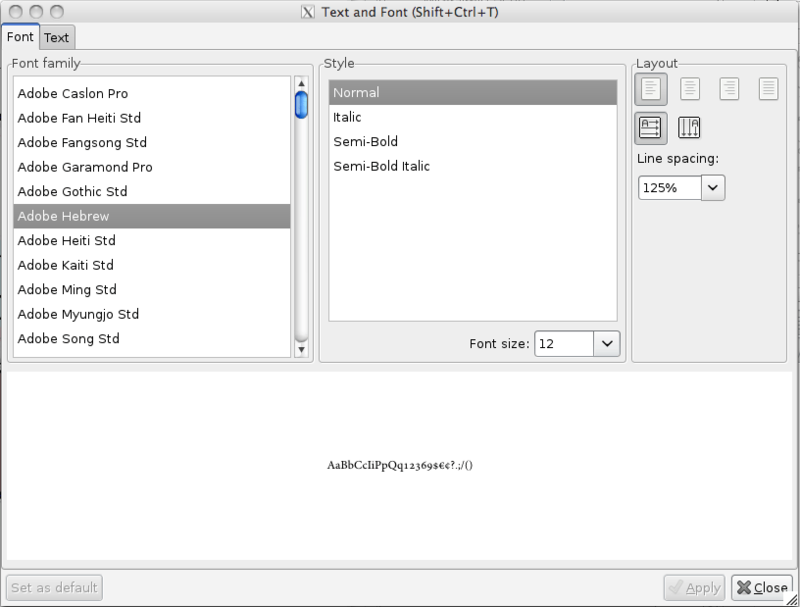 The Text and Font Window is basically another way of manipulating your text in Inkscape. It has two tabs. The Font tab covers all of the basics: Font, Style, Size, Layout, and Line Spacing. When you click the Text tab, you’ll see the text in a plain fashion, much like a plain text editor. Inkscape’s Align and Distribute Palette is much like any other similar align and distribute palette. But Inkscape’s version take alignment a step further. Within the Align section of the Align and Distribute Pallet, you can align your object relative to the last selected, first selected, biggest object, smallest object, the page, the drawing, and the selection. Inkscape even gives you the option to treat multiple selections as a group. You can align along the most extreme of a specific edge. For example, if you have a group of three squares, and you click on the Align left edges of objects to the right edge of the anchor, Inkscape will align all of the square’s left edges along the object with the most extreme right edge. Inkscape squares before clicking Align left edges of objects to the right edge of the anchor. Inkscape’s Align and Distribute Pallet also works with text baselines. This can be extremely beneficial if you feel the need to align separate pieces of text by hand. The Distribute Section of the Align and Distribute palette specializes in spacing. It allows Inkscape to space your selections based on specific edges, the objects’ centers, or you can space the gaps between objects equally. Text also can also have their baselines distributed. A visual of objects after Unclump objects button is clicked. I think this is a useful section of the Align and Distribute Pallet. You’ll find numeric fields, one for the minimum horizontal gap between objects (represented by H), and another for the minimum vertical gap between objects (represented by V). Both of the numbers are in units of pixels. The button to the right of these numeric fields will space your selections based on what you entered in the numeric fields. A visual of the Connector Network Layout section. The result of Connector Network Layout. Now I’m going to go over some commonly used and necessary tips. Grouping and ungrouping vector objects is pretty commonly done in most vector programs. To group selections, click in the menu bar > Object > Group, or you can use the keystroke Ctrl-G. To Ungroup a collection of objects click in the menu bar > Object > Ungroup, or you can use the keystroke Shift-Ctrl-G.
By this point, you’ll already know about specific objects you can create in Inkscape, and that they can be filled and stroked like paths. (ie – squares, circles, stars, 3D boxes, spirals, text, etc.) Eventually you’ll want to manipulate these objects further or merge them with other paths or objects. To convert any object into an edible path, click in the menu bar > Path > Object to Path. Or you can use the keystroke Shift-Ctrl-C.
Stroke to Path is another common action in most vector programs that allows you to convert any path with a stroke into a path itself. You can find this in the menu bar > Path > Stroke to Path. Or you can use the keystroke Ctrl-Atl-C.
Boolean operations are common actions used in most vector programs to manipulate vector objects. You can find these in the menu bar > Path. Tap the Spacebar while dragging a selection to duplicate it. Holding down the Spacebar while dragging a selection will create an effect similar to the Spray Tool. To add Nodes to any path while using the Node Tool, just double-click on a path. To delete a Node, select a node and tap the Delete key. To duplicate any path, use keystroke Ctrl D.
To create a clipping path, select two paths, and go into the Menu Bar >> Object >> Clip >> Set. To release a clipping path, go into the Menu Bar >> Object >> Clip >> Release. In Inkscape, SVG (Scalable Vector Graphics) is the file format used by Inkscape. By default, Inkscape uses its own variation of the SVG format, Inkscape SVG. Inkscape SVG files contains data specific to Inkscape and it’s features. Inkscape does export to standard SVG (Plain SVG) format and compressed variations of SVG. Art created in Inkscape can be saved in numerous other file formats, including pdf, eps, and ps (PostScript). If you plan to go back and forth between Inkscape and Adobe Illustrator, I recommend using Inkscape’s default SVG format. Even though I get a bunch of errors dialogs while opening Inkscape SVG files in Illustrator 10, I get the least trouble this way. Plus Inkscape’s layers are preserved. I’ll go into this deeper in a future Inkscape tutorial. But that’s what’s currently working for me. Now if you have plans to export your work into Adobe PhotoShop or GIMP for further work, that’s not so straight forward. Unfortunately, Inkscape doesn’t directly export to psd or GIMP’s native file format XCF. So far I know of no way to export your Inkscape art while preserving your layers at the same time without having to go through Illustrator. Alexandre Prokoudine from Libre Graphics World did claim in an email that Inkscape can export to Gimp’s XCF file format, which would preserve your layers. There are also a couple of sources on the web that make this claim as well. Personally speaking, I so far lack that ability in Mac OSX, Windows, and Fedora Linux. There is a thread that contains a possible solution. This requires finding your path variable, and adding the path to an installation of Gimp. I will continue to investigate this. (April 17, 2013) I was able to enable Inkscape’s ability to saving to XCF in Fedora Linux and in Mac OS X (via MacPorts) by simply installing Gimp. I assume installing Gimp in Fedora and OS X also installs some libraries that Inkscape is able to access. Gimp does not need to be running to export to XCF. All layers that have an object will be preserved. Any empty layers will vanish by the time you open your new XCF file in Gimp. I would like to assume that this is the case in other variants of Linux, but I can’t personally confirm that. Before this, I had installed a natively compiled copy of Gimp on my iMac. (running OS X 10.6.8) Even though I like this native version of Gimp, I was still unable to save to XCF in Inkscape. I compiled a version of GIMP via MacPorts. (That means using X11.) You can also compile a version of Gimp via Fink. I’ll also make an attempt at installing Gimp in Windows 7. (April 19, 2013) It is possible to get Inkscape to export to XCF in Windows. This has to be done by setting the path variable that leads to your installed copy of Gimp. Also you need to rename both the application file (appended with .exe) and the folder that contains the application and its support files. I had success in Windows 7 doing this. I have a step-by-step guide on how to enable saving to XCF in Windows. There is a SVG plugin for PhotoShop, but it takes a while for it to decrypt your SVG file. The other downside is that it won’t recognize your Inkscape layers. Also it’ll create a layer for every single object and path that’s in your SVG file. So if you’re working on a piece that uses a ton of paths, then it’s not even worth it. If you’re not so worried about your layers, you can easily export to a PNG file. The downside to that is that you’ll be working with a flatten, rasterized version of your image with some transparency. (If you haven’t created any background in your image yet.) When I was working on the header for the State of the Site post, I came to the decision to treat it like line art in Photoshop, and set the blend mode to Multiply. I was able to quickly color it. For the webbing, I duplicated the layer, set the blend to normal, locked the transparent pixels, and colored the webbing with the Brush tool in PhotoShop. April 21, 2014 — Updated Wikipedia link. (Special thanks to Francesc Dorca.) Also cleaned up some spelling and grammar. April 19, 2013 — I found a way to enable saving to XCF in Inkscape on Windows. April 17, 2013 — Confirmed that XCF can be enabled in Inkscape on Fedora by simply installing Gimp. April 6, 2013 — Special thanks to Alexandre Prokoudine of http://libregraphicsworld.org for his suggestions and corrections in regards to spelling, grammar, the Node tool’s ability to edit gradients, and the possibility of XCF export.